Artillery ammunition was packed in sturdy wooden boxes at the factory or arsenal and shipped to the front. In keeping with authenticity, our boxes are made to the precise specifications given in the US and CS Ordnance manuals. Our boxes are constructed of 1.25″ Pine with rope handles. The corners are box slotted, glued clamped and nailed for added strength. Rifled Ammunition is made from Iron and is CNC turned. The Case shots have the correct thickness of walls and are filled with lead shot and resin. The shells have the correct wall thickness as well. All can be fired/will take the rifling. 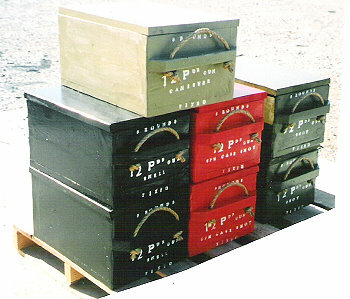 Our boxes are the correct size, weight, and material like original ammunition boxes used in battle, but NEW! The caliber, type and quantity are stenciled on both ends of each box. These are great for Living History Set-Ups, camp accessories, etc. In the midst of battle you can never have enough 12 Pdr ammunition boxes. All prices are plus shipping and handling from Blaine, TN 37709.